Would you like to have so many requests for project proposals that you can pick and choose which clients to accept? It is truly possible. Watch this free training webinar and learn 8 specific, easy to implement techniques that will set you on the road towards having as much design work as you can handle! Click the video to pause and restart playback; double-click while playing to watch it full-screen. The webinar recording runs for approximately 1 hour 33 minutes. The first couple of minutes show a still image with Eric Bobrow speaking. After the introduction, there will be lots to see, so be patient and stay tuned. Don’t miss the last section of the video, when Eric shares some important announcements and links. Due to the time-sensitive nature of some parts of the presentation, this video replay will only be posted for a short time. Please make sure you watch it right away before it is taken down. This is very informative and the real examples are great. Unfortunately, the website template you have chosen is quite bad. The video has no controls to scrub the video. Not many architects can watch such a long video without multitasking and you know something eventually goes wrong with the browser window or connection. Why not have it on Youtube? You mention WordPress but these are Blog templates and can rarely achieve an artful looking website without finding a special template so you can have categories at the top such as Projects, Priofile etc. Can you comment on Virb, Behance, Cargo and other such services? Lots of companies offer web ranking and search optimization. There are also many books available. How is your course different? What if you have clients in the same city. All of them can’t rank first. 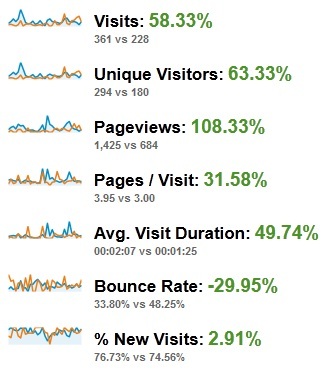 Is it a constant battle to keep ones site on the first page as so many companies offer ranking services? It seems to me you first need to have a good website to show before getting much traffic. Does your course cover the design of the website first? Thanks for your comments and your continuing challenge to me to explain and clarify even further these areas. I truly appreciate the dialog. The lack of video controls is quite deliberate. This is a replay of a live event. There is certainly something convenient about YouTube and DVR recordings of TV programs, in that you have more control, and can skip around to whatever parts you wish. However, this presentation was designed as a live event, and I deliberately explain and demonstrate things in a certain sequence, and I have chosen not to facilitate multitasking. If you want to learn from what I’ve got to share (at least right now, with this webinar) you will need to sit down with your tea or coffee or whatever and focus on the presentation. I will likely create smaller videos for posting on YouTube later on. I’ve got lots of experience in this regard, with my ArchiCAD Tutorials channel having over 25 videos and more than 300,000 views. But that’s for later, when I get some time. WordPress is a very versatile platform. You will see sites of all kinds built on top of it. The only way to know something is built in WordPress is to look at the HTML source (which you can do easily in any browser); the visual appearance may be very different from one to another. Not only color and style, but also site structure and navigation can be almost anything you wish. In many cases, the blog is only a small part of the site. For an excellent example of a client website check out http://www.sarcoarchitects.com. The other services you mention (Virb, Behance, Cargo, etc.) may be good, or even great – I haven’t heard of these particular ones. What I do know is that WordPress is free, one can get very usable themes (basic styles) for free or pay for a “premium” theme for $40 or $97 etc., Google loves these sites (it’s easy to do basic or sophisticated SEO), it’s user-friendly (anyone can learn how to create new pages and add pictures etc. without needing a web authoring tool), and it’s extremely well-supported (thousands of free or paid plugins to extend the platform) and widely used (latest estimate: one-sixth of the sites on the entire internet are based on WordPress). That being said, the principles of effective marketing are not dependent on your platform. If you use one of these other tools, you can be just as effective, if you apply the correct strategies. With regards to how my course is different, here are my thoughts. I have been working with architects for well over 20 years, so I know the profession well (unlike 99% of the companies offering ranking and search optimization). I understand the sensibilities, the aesthetics, the precision, the professionalism, and the dedicated combination of artistry and practicality that is part and parcel of an architect’s world-view. Books in general are great resources, but they are not for everyone. (How many marketing books have you read in the past 5 years?) Many people prefer video to reading, and there are many things that can be easily demonstrated that are much harder to understand when limited to the printed page. The course will also be interactive. One of the most essential parts of all learning experiences is figuring out how to apply the principles to the actual context at hand. I am a “good explainer”, and this comes out even more dramatically when people ask me questions. I quickly get to the heart of the matter, and answer not only what they directly ask, but expand and connect things in ways that increase the overall comprehension of the subject. I have built in the Q&A sessions into the course for this exact purpose. 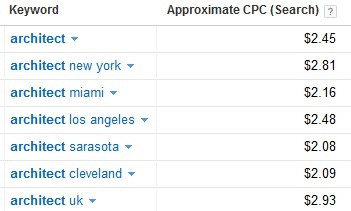 With regards to having clients in the same city, it’s not a problem right now. With under 100 participants spread out all over the world, it’s unlikely that more than two or three will be in the same exact area. Over time this may change, but I haven’t promised anyone that I will rank them number one. I have promised that I will teach you how to improve your rankings AND learn how to make a deeper connection with your prospects so that they know, like and trust you, and will want to work with you. If you are concerned about competition, then it’s best to educate yourself so that you are better prepared than others in your field. In general, architects are not very trained in marketing, and have some serious blind spots, so a little education can go a long way towards putting you in a much better competitive position. With regards to design of a website, we’ll be looking at basic principles such as clear navigation, essential content and pages, legibility, focus, etc. You will learn some important aspects of website design that will provide a good foundation that you can build on top of. Sort of like the basic foundation, structure and layout of any building, that you can then “dress up” in a wide variety of styles, construction materials or budgetary options. I hope you find these comments useful. Feel free to keep asking questions – it’s the best way to learn! Oh, I forgot one thing. You asked if “it is a constant battle to keep ones site on the first page”. This is a bit of a misnomer. There is no single “first page” for everyone to compete over. There are as many first pages as there are web inquiries, and even then, this varies depending on the person searching. Try typing “architect” into Google from one location, then go to a another place. You’ll get different results. Try typing “modern architect [city name]” or “home remodel [city]” or “custom home design [city]” or… People will use descriptive terms as they search, trying to get the most relevant information and listings, and Google does its best to tailor the response to their inquiry. In fact, as Google adds more social media input into its ranking algorithms. we’re seeing that listings are being “colored” or modified based on your previous visits and even visits or “+1’s” of your friends. So ultimately, it’s becoming more and more like the real world – there is no “main street” or single location that is ideal for reaching everyone. It depends on where they are, and what they need or are looking for. This doesn’t mean giving up on targeting to be #1, it means understanding it in a broader sense, and of course, being #2 or #3 (or anywhere on the first page of a frequently searched keyword phrase) isn’t bad – just being seen is an achievement that gives you a real chance to succeed. Your description of rankings is very good and something I had not considered. It is morphing continuously and tries to be all things to each individual I suppose! You keep talking about Google, but what about Bing and other search engines. Do they basically give the same results. I was thinking of switching my search engine to Bing just to spread the love, but don’t do it because I am afraid I will miss out on the best results as the majority of people use Google. Exactly how does this work? I keep talking about Google because about 67% of the searches on the internet are done in Google. I think the other search engines are worth checking out. I doubt you’ll miss out on the best results – in general, they all use somewhat similar processes to analyze sites. (3) creating a follow-up strategy that keeps you in front of these leads, building a relationship and establishing authority, so that when they are ready to work with an architect they will definitely want to contact you. Thanks for this opportunity to see your presentation as I failed to see it when it was first offered. I do not yet have a web page posted. Will this be a terrific hindrance to be able to benefit from the course? I have someone whom I’ve contacted and I have a domain name on GoDaddy, but as I said, no website yet. It is not a problem that you do not have a website yet. You’ll be able to start off cleanly, with an effective approach, establishing your online presence in a way that will work better than most architects who haven’t learned these principles. Thank for your wonderful presentation on internet marketing which, in this of the world is not yet active at all. This will provide a good impetus for architects in this part of the world to switch to sooner or later. Eric, thank you for sharing this valuable information. The information and ideas you present are not readily available or common knowledge within the profession. Thank you for a very helpful presentation. 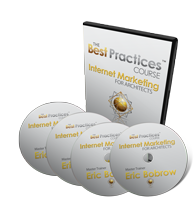 I jotted down the link to internetmarketingforarchitects but can’t see where I can sign up for the course (not the 1 hr presentation) but the 12 week course. Can you assist please. 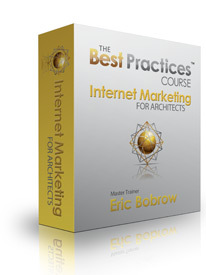 I’m glad to know you are interested in signing up for the Internet Marketing for Architects 12 week course! I missed the webinar but have just finished watching the replay – thanks for that! Really great and timely as I’m now looking at marketing in the tough market. Time to sort out that website so I will be looking seriously at your course. Simply suppppperb ! I just love this presentation. I gain lots of ideas without spent a single penny …I am in india …but during watching it I d’t feel about distance for a minute …..thnks a lot Mr. Eric Bobrow. Please see my note to Gerald, who had a similar question. The beginning looks like there is no video, just a still image, but then after a couple of minutes, I start to show things. I can hear to sound, but there is no video on the replay. Are there special settings for my browser I need to know? The opening of the webinar had a still image for the first few minutes. After that point, you’ll see things start to be shown onscreen. have emptied Safari Cache, and restarted but still no Video, help? Eric have tried to log on but no success, Using Macintosh Safari should this open this video? Yes, the video should show up OK in all web browsers. I’ve tested it in Safari and Firefox and Chrome on Mac, and Firefox and Internet Explorer 9. I suggest that you try it again. You may need to clear your browser cache to make room for the video data, or quit and restart the browser, or switch to a different browser. Let us know how it goes.